University High School social science teacher Robert Fitzgerald. 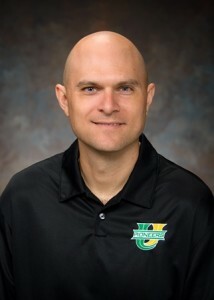 University High School social science teacher Robert Fitzgerald ’97, M.S.E. ’04, Ph.D. ’13, has been offered a Fulbright Distinguished Awards in Teaching grant to the United Kingdom. Fitzgerald is one of only 45 U.S. citizens who will travel abroad through the Fulbright Distinguished Awards in Teaching Program in 2016–2017, sponsored by the U.S. Department of State and the J. William Fulbright Foreign Scholarship Board. The program operates in over 160 countries worldwide. Recipients of Fulbright grants are selected on the basis of academic and professional achievement, as well as demonstrated leadership potential. The Fulbright Program is an international educational exchange program sponsored by the U.S. government and is designed to increase mutual understanding between the people of the United States and the people of other countries. Fitzgerald, a three-time Illinois State University alumnus, will be going to the United Kingdom for spring 2017. Most likely he will be at the University College London Institute of Education, where he will take classes and work with U.K. teachers on making their and the U.S. history curricula more inclusive to reflect the diverse and multicultural populations. Since 1946, under legislation introduced by the late U.S. Senator J. William Fulbright of Arkansas, the Fulbright Program has given approximately 360,000 students, scholars, teachers, artists, and scientists the opportunity to study, teach and conduct research, exchange ideas, and contribute to finding solutions to shared international concerns. A total of 53 Fulbright alumni from 12 countries have been awarded the Nobel Prize, and 85 alumni have received Pulitzer Prizes.